This kit was sent to me for review by Rice Force. Description: The every-night removing of make-up may irritate the skin which is why it needs to be gentle. The Make Up Remover by Rice Force gently frees the skin of make-up and impurities while it concurrently deeply moisturizes it by means of the Rice Power® Extract No. 2. Not only is the application by the special Make Up Remover Original Brush gentle to the skin but it can also clean the difficult locations which we often omit when removing the make-up. After the application, the skin feels smooth, fresh and soft. It has hypoallergenic composition and a pleasant and discreet scent and may also be used by people with atopic eczema. Directions: Squeeze a small amount (about 1/4 inch) into the palm of your warm, dry hands. Rub your palms together to warm the gel into a liquid. Gently smooth over your dry face until it glides easily. When the makeup melts away, add water to emulsify into a milky-white liquid, then rinse away. Performance: This is a very smooth gel that feels very slippery against the skin. It does remove makeup and sunscreen easily for me, and leaves my skin feeling soft. The "silkiness" does leave a slight film on my skin though, which is easily washed away by double cleansing. Description: The care for your face may be an unbelievably pleasant experience. With the Mild Face Wash and its application by the Mild Face Wash Original Washing Brush you will create mild foam which can change the unpopular every-night make-up removal to a relaxation ritual. 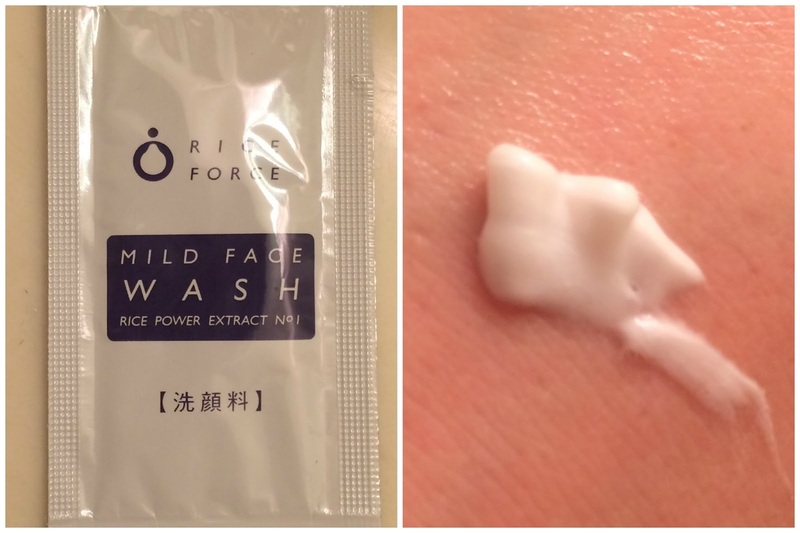 This facial treatment containing the Rice Power® Extract No. 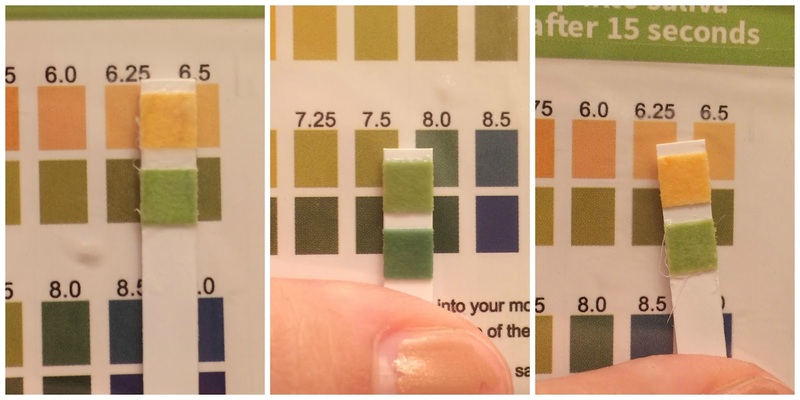 1 and balanced pH will provide suppleness even to a very dry skin. The result is perfectly cleaned, hydrated and protected skin. The fresh soap scent only adds up to the great hydrating effect. The hypoallergenic composition allows the use even for skin with atopic eczema. Directions: Take a small amount (about 1/4 inch) and work up a rich lather. Gently wash as if rolling the bubbles over your face, then rinse away. Performance: This is a very creamy face wash, I love the texture! It's thick, creamy, and foams nicely - and it has a pH of about 6.5. I feel like this cleanser does not strip my skin or dry it out, but my skin is a bit pink after use. Cleanser Alone - My Tap Water - Cleanser Mixed With Tap Water. Description: If you long for invigorated, silky and youthfully looking skin, there is no better choice for you than the Deep Moisture Lotion. This lotion with the content of the Rice Power® Extract No.11 absorbs immediately and its hydration effect can be felt in first few seconds after the application. Simultaneously, the wholesome influence lasts for long and persistently invigorates the skin while protecting it from the inside. The hypoallergenic components and lack of scenting perfectly suit even a very sensitive skin and skin suffering from atopic eczema. Dry skin will appreciate immediate hydration of the driest facial zones. Directions: After thoroughly cleansing, apply 3 to 5 drops to the entire face. For deeper permeation into your skin, use the warmth generated by your palms and softly envelop your face and gently press. Re-apply to dry areas as needed. Performance: In Japan, lotions are not the same as Western lotions - they are toners (or skins if you're used to Korean terminology). This is a thicker toner, one that does not require a cotton pad to apply. It spreads on the skin easily and absorbs instantly. I had to apply it in sections or it would dry before I could spread it to other areas of my face. My face stung slightly during application. 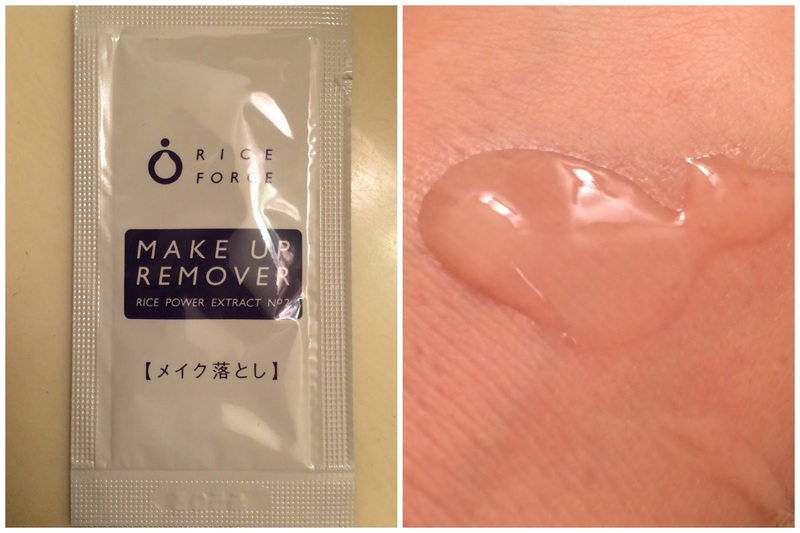 Description: The highly concentrated essence enriched by the Rice Power® Extract No. 11 can miraculously reduce gentle facial lines. Thanks to this treatment you may rejuvenate gentle skin around your eyes and mouth and support overall elasticity of your skin. Handy dispenser allows for easy utilization at any time of the day. The essence has a pleasant texture not leaving a greasy and sticky touch. It is hypoallergenic, without scenting and colouring and suitable for a skin with atopic eczema. Directions: After Deep Moisture Lotion, use 1 to 2 pumps of Deep Moisture Essence and massage onto your face. 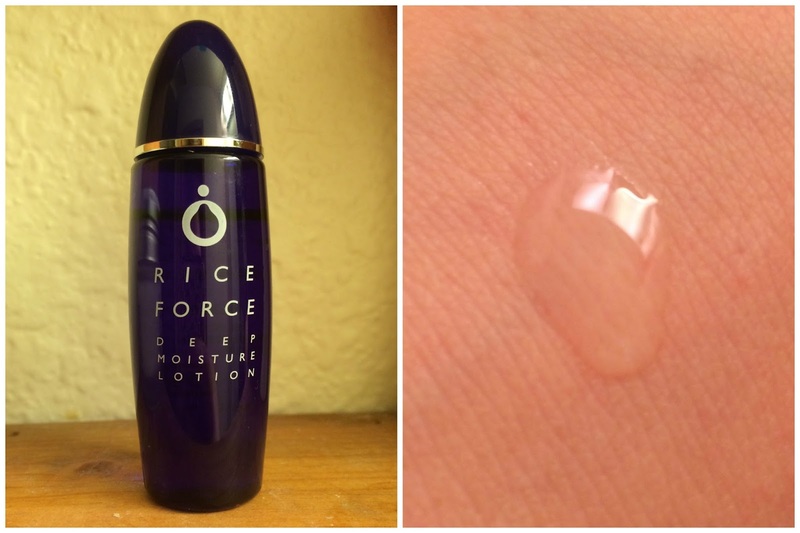 Performance: This essence is pretty thick compared to what I'm used to - it's more like a gel. It has a silky texture that spreads easily on the skin, and it does absorb pretty quickly. However I noticed that it does leave a slight film on my skin, and leaves my face craving more moisture after it has fully absorbed. I feel like this essence makes a good booster for the cream. Description: The light and fresh constitution of the cream containing the Rice Power® Extract No. 11 leaves the skin smooth, soft and elastic. It also goes well with care for the gentle skin of neck and neckline. The quickly absorbing non-greasy composition may be applied at any time of the day and suits even an otherwise very sensitive skin. The long-term hydrating effect is achieved thanks to the hypoallergenic ingredients without scenting and colouring allowing the application to a skin with atopic eczema. The Deep Moisture Cream moreover has the ability to lock-in the hydration brought by the previously used Deep Moisture Lotion and Deep Moisture Essence. Directions: After the Deep Moisture Lotion and the Deep Moisture Essence are applied, use the spatula to scoop out a dime-sized portion and smooth over entire face. Extend your skin care regimen to the age-revealing neckline with the leftover Deep Moisture Cream on your hands. Performance: This cream is pretty typical for me - it has very little scent (like the rest of this line) and it has a light texture. It's creamy, and spreads easily onto the skin. It absorbs within 30 seconds to a minute and leaves my skin feeling soft and pliable. 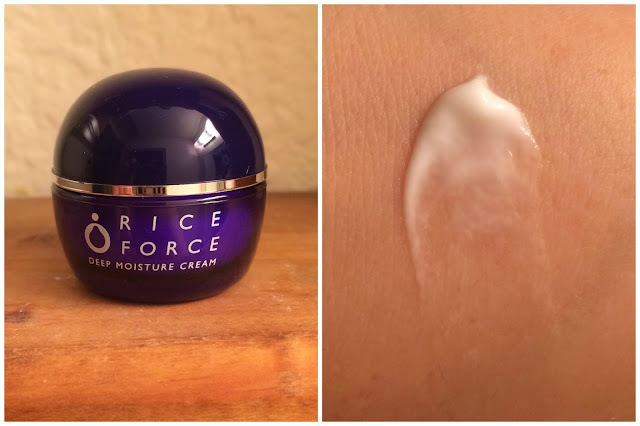 I love the silky texture, again, which is common throughout the line, but this cream offers a nice amount of hydration as well that works for me during the day or at night layer with something a little heavier. Description: Prevent the harmful UV rays and free radicals from adding to your age. The best way is to use the UV Protect Milk as a base under your foundation which can provide the protection. It contains the Rice Power® Extract No.1 which concurrently nourishes the skin and allows for longer life of the make-up. Its velvety texture does not plug pores and the skin may therefore breathe freely all day long. And you can breathe in its beautiful scent. You don't need to worry about any white stripes or greasy effects. The SPF25/PA++ factor recommended for daily use during common activities and low-intensity exercise is a matter of course. Handy dispenser will save your time in the morning rush. Due to the lack of scenting and additives and the hypoallergenic composition, the lotion does not have to be avoided by skin with atopic eczema. Directions: Shake well and apply a dime-sized amount to your face. Easily removes with Make Up Remover and Mild Face Wash. Performance: I'll just start by saying I'm not a fan of sunscreen in the slightest, but this one has it's high points. It's thin, easy to apply, spreads onto my skin smoothly, and absorbs quickly. I wish it were offered at a higher spf than 25, but it'll work for the winter-time when I'm mostly indoors or just running to and from my car. 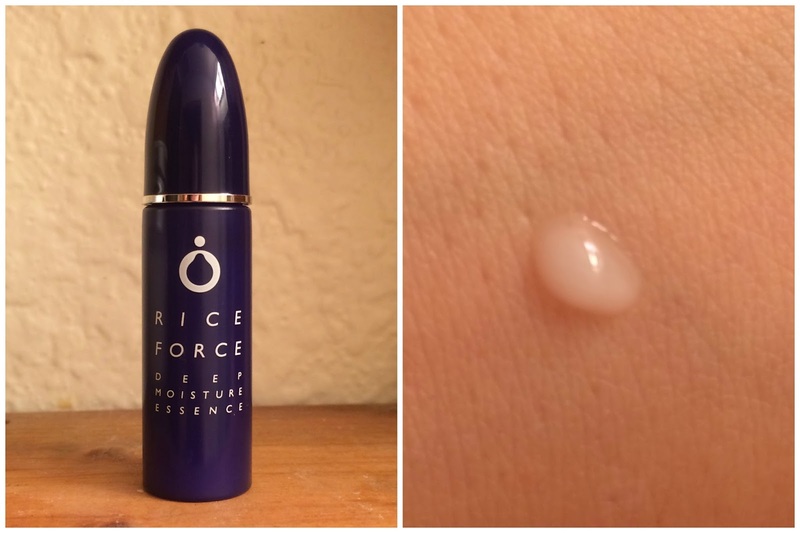 I was initially very excited to try these products - I love rice as a skincare ingredient, and was excited to see that ingredients shine behind an entire company dedicated to using it as a star for their products. While the individual products all have their highlights, and some were better than others, in the end I felt like these products just didn't play nicely with my skin. Some products have pretty nice ingredient lists, but others have a few potential acne or irritation triggers that may or may not cause problems for skin. I am sensitive to harsher alcohols, so I tried to ease into this system, but it was clear after the first couple tests that the lotion and essence were going to be too harsh for my skin to tolerate. I tried to use it a few times afterwards but my skin broke out. The cream seemed like it was nice and hydrating when I tried it with the kit, and offered relief from dryness and irritation, but my impression during the trial is that it may have clogged my pores. 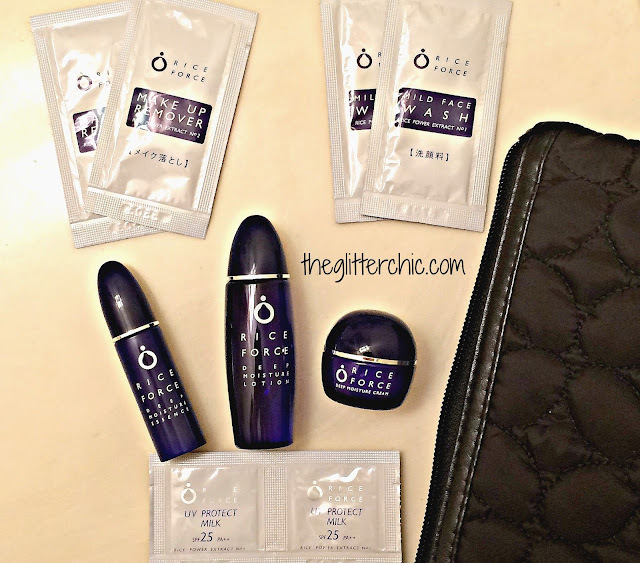 My advice is to look over the ingredients first and watch for any known triggers your skin has, and if it looks good to you I would definitely start with this deluxe trial kit. This kit is a great value, and is a perfect way to really get a feel for the Rice Force system. If you are interested in giving this set a try, you can find it on sale right now on Rice Force for just under $30 ~ including everything shown in this post (yes, even the beautiful black cosmetic bag). Ugh, rice force is garbage. Just garbage... Anyone in Japan can tell you that. 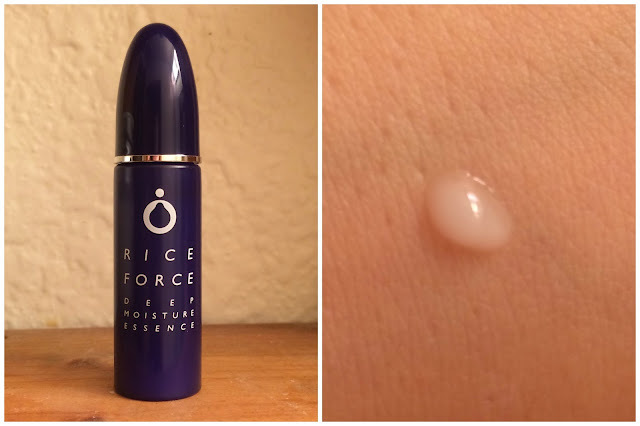 It's over priced, poorly formulated, harsh for delicate skin, quite drying, doesn't want to play nicely with non-RiceForce products and after disappointing sales in Japan (and the rest of Asia), I guess they think they can ride the wave of AB popularity to the West and make some profit that way. You want nice, smartly formulated products with natural ingredients that are alcohol-free? Look at Fancl and HABA. For rice stuff, if that is what interests you, a much better choice would be Rice Power line from Kose. I guess that is what Rice Force is trying to emulate and copy, but with rather disappointing results. Thanks for the info Anna, I really appreciate it!